In collaboration with Andrea Rodarte and Linda Hirst from UC Merced, Andrew and Tim published a new paper in Phys Rev E last week. The paper uses simulation techniques developed by Andrew to better understand the deformation and chaining behavior of soft shells in a nematic liquid crystal solvent. 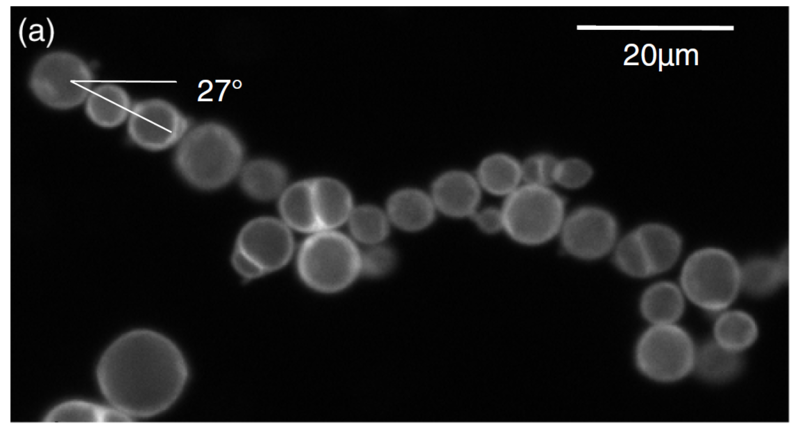 These shells, which are formed by clustering nanoparticles, elongate and form long chains when left in the host nematic solution. Fluorescence microscopy of the experimental system reveals slightly elongated shells that chain together at a characteristic angle. By comparing simulations of the system to experimental observations, Andrew was able to identify the relative strengths of shell surface tension, and anchoring between shells and liquid crystal molecules. Additionally, he was able to predict the angle at which shells align based on shell aspect ratio and anchoring strength. This project kicked off when Linda visited Tufts University and presented this fascinating system in the department colloquium, and we are thrilled to share the product of this collaboration with the soft matter community! Shells located in the same vicinity will repel if aligned at angles that are too acute or obtuse, but then rotate around to find their preferred alignment angle.